Sometime during the 5th century BC, the Chinese noticed that when light passed through a small pinhole, it reflected the image of what was on the light side of the hole upside down onto the opposite wall. It took many of hundreds of years, but eventually this observation would coalesce into the camera obscura - the very first device by which "photographs" were made. In contrast to that slow development, the evolution of the photographic process from the mid-19th century to after the American Civil War happened at light speed (pun absolutely intended). In our Winter Gallery Auction we are offering a number of interesting early daguerreotypes, tin-types and cartes de visites that illustrate the changing photographic landscape of the second half of the 19th century. In the early 19th century, an aspiring lithographer named Joseph Nicéphore Niépce was searching for a way to improve on the camera obscura, which up until that point had been used mainly to aid painters in making lifelike tracings of the world around them. Nicéphore discovered that if he treated a metal plate with bitumen, the light from the camera obscura would leave an image on the plate. In 1829 Nicéphore partnered with Louis Daguerre, who was also looking for a way to make permanent images with light. Nicéphore died in 1833, but Daguerre continued to experiment, and landed on the process for making "daguerreotypes" by using silver iodide on copper in place of bitumen. The government of France ultimately awarded lifetime pensions to Daguerre and Nicéphore's son Isidore in exchange for the rights to their discoveries. The daguerreotype made its way to the United States by way of Samuel Morse, the inventor of the telegraph and Morse code. Morse was in Paris just as France was unveiling Daguerre's invention to the public in 1839, and Morse studied the process with Daguerre himself. He came back to New York, began to teach the new technique to others, and by 1841 there were more than 100 daguerreotype studios in New York. One of Morse's most well-known students was Mathew Brady, who famously chronicled the Civil War in more than 10,000 photographic plates. Brady first opened a daguerreotype studio in New York and took pictures of 19th century celebrities such as Walt Whitman, Edgar Allen Poe, Frederick Douglass, and many, many more. The picture of Abraham Lincoln on the five dollar bill was taken by Brady. Many of these first images were daguerreotypes, but the photographic process was never a static technology for long. Brady soon began making albumen prints - multiple prints from a single glass plate, printed on paper coated with egg white - which allowed him to distribute many copies of his images. With these prints the photo was taken out of the studio and democratized. As the Civil War gripped the country, having one's picture taken to send to loved ones became more and more popular. Brady's unflinching photos of the battlefield (taken by him and a huge corps of photographers who he hired) brought the conflict into people's homes in dramatic fashion, and soldiers were able to send pictures of themselves home from the front. Along with albumen prints, tin-types were an economical mode of taking an image on a plate of iron that didn't require drying, and enterprising technicians developed methods for coloring them through complicated applications of chemicals, paints and varnishes. Brady's counterpart in the South during the Civil War was a man named George S. Cook, a northerner who seems to have remained largely apolitical throughout the war, a neutral observer of the unfolding chaos around him. Cook was born in Connecticut, but spent most of his career in Charleston. In the 1850's Cooke returned to New York to manage his colleague Mathew Brady's studio while Brady was abroad in Europe. Brady had to cut that trip short, however, when he got word that Cook had opened his own, competing New York studio even while he oversaw Brady's. At the height of his career, Cook had studios in Charleston, New York, Philadelphia, New Orleans and elsewhere. He took some of the most famous photographs of the Confederacy during the Civil War, including images captured in the thick of battle in Charleston Harbor. Surviving photographs by him are therefore highly valued by collectors, such as the below studio portrait of a young girl in Charleston, likely taken before the Civil War. Napoleon III and Queen Victoria are credited with popularizing the CdV, but trading and distributing them was hugely in vogue in the United States as well. In many ways, cartes de visites were the first social media - they allowed people both to present themselves to the world in a completely controlled manner and to form opinions about each other based on that visual presentation. 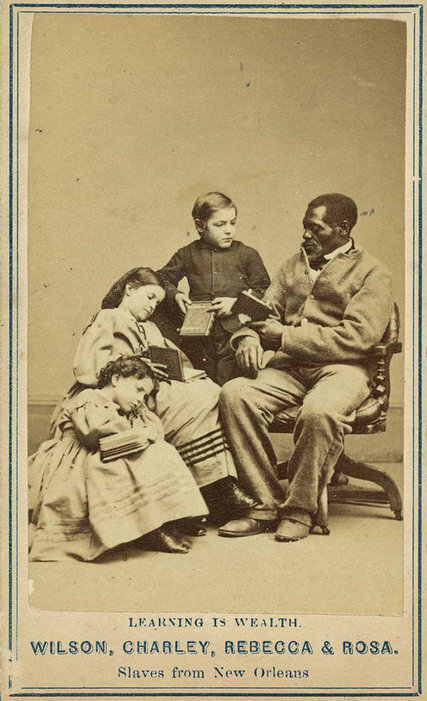 Acquaintances traded each other's cards and bought and collected the cards of celebrities, and by the end of the Civil War they were even being used as a propaganda tool by both sides of the conflict. It is tempting to think that the advent of the photograph gave us the ability to see history exactly as it was, rather than through the filter of any artist or writer. Of course in this age of extreme digital manipulation we know how untrue that is for our current time, but even looking back at the very first photographs from that last half of the 19th century only shows us how hard it is to pin down the concepts, like race, politics, and the social order, that undercut the truths we hope to find there. What we find most often instead, is the enduring, fascinating complexity of humanity.